Re: You're a Vernonite if you can remember . . . Does anyone know what year(s) that Rubin Taylor ran the Capital Taxi stand? And was it in the side entrance/basement of the Kal hotel? gypsymama1 wrote: Does anyone know what year(s) that Rubin Taylor ran the Capital Taxi stand? And was it in the side entrance/basement of the Kal hotel? Does anyone remember when the employees of radio station CKAL which was up on the highway across from the College demonstrated downtown over the owners selling the station or something. Was big news in the day especially on CJIB . Often wonder what really happened there. Noisy Boater wrote: Little Mix Concrete?? I think his name was Stan Johnson. They are a shirt tail relative of mine. I think Stan is my aunts brother. Verminator wrote: McLeod's Hardware store downtown. The Lakeside Hotel and the old tugboat at Paddlewheel Park. Normie Ogasawara's store on 27th avenue. What a great guy. The SuperValu store where Staples is now. The lunch counter at Woolworth's. There was a trucking company or something that burned to the ground in 1973 about where the downtown Shopper's Drug Mart is. Anyone remember what it was called? I think the mid 60's till early 70s he owned it? His daughter Carmen went to high school with us. 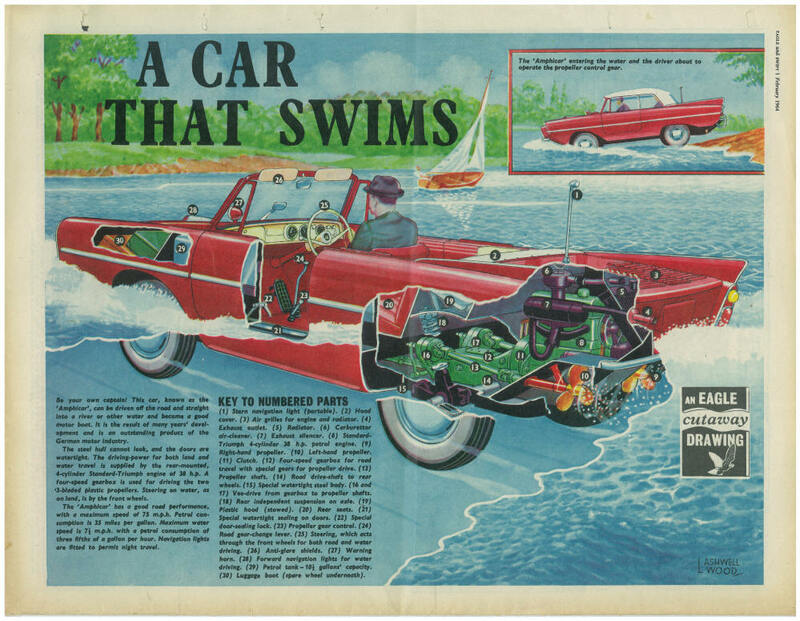 At one time Rubin owned one of those little cars that you could drive right into the water...Aqua Car? Maybe blue? I think Capital Taxi had a little dispatch office on the alley side wall of the Capital (Towne) Theatre. superbee wrote: At one time Rubin owned one of those little cars that you could drive right into the water...Aqua Car? Maybe blue? ... from a boat ramp and was driving it back and forth, past the Kalamalka beach. Seems to me it was a young guy and his girlfriend in the front seat. There was a boat in the area towing water skiers, and it made a deliberate run at the much less maneuverable car. The skier did a sharp turn just a few feet from the car, spraying and soaking the couple with a thick wall of water. Then karma kicked in -- the skier wiped out, losing both his skies. One was right near the car, so the car's driver quickly pulled alongside, grabbed the ski, and made for the boat ramp. The boat caught up before he got there, but he wouldn't give the ski back, and drove up the ramp and out of sight. There were actually people on the beach applauding, as he made his escape with the ski. Norm's store was on 27th Ave and is now a child care place. I'm not sure if it had other uses in between. Suicide Hill. Other tests: do you remember where the Drive-In used to be...? dmj_okanagan999 wrote: Other tests: do you remember where the Drive-In used to be...? 48th Ave and 23rd St. There are a couple empty fenced in lots around Vernon. I can't remember all of the streets they're located at, one is by pizza hut,the other is by polson automotive. The third one is corner of 39th and 29th. My dad was saying that they used to be gas stations or something to due with gas of some sort. TheBoss wrote: There are a couple empty fenced in lots around Vernon. I can't remember all of the streets they're located at, one is by pizza hut,the other is by polson automotive. The third one is corner of 39th and 29th. My dad was saying that they used to be gas stations or something to due with gas of some sort. The one by Pizza Hut was a Chevron. The one on 39 and 29 was a storage facility for Esso IIRC. The one by Polson Automotive was also a storage facility, Shell IIRC.